On 22 March the University of the West Indies (UWI) Seismic Research Centre (SRC) and the National Disaster Management Agency (NaDMA) reported that seismicity at Kick 'em Jenny continued to decline. The Alert Level was lowered to Yellow (the second lowest level on a four-color scale) and the maritime exclusion zone was adjusted to a radius of 1.5 km. A submarine volcano located about 8 km off the N coast of Grenada in the Lesser Antilles island arc, Kick 'em Jenny most recently had erupted during 23-24 July 2015 (BVGN 40:08), when two submarine explosions had been detected. This report covers a short-lived eruption on 29 April 2017 as reported by the Seismic Research Centre (SRC) at the University of the West Indies (UWI). An advisory notice issued on 29 April 2017 by the Grenada National Disaster Management Agency (NaDMA) in collaboration with UWI-SRC reported increased seismicity associated with the volcano, including a high-amplitude signal lasting 25 seconds. 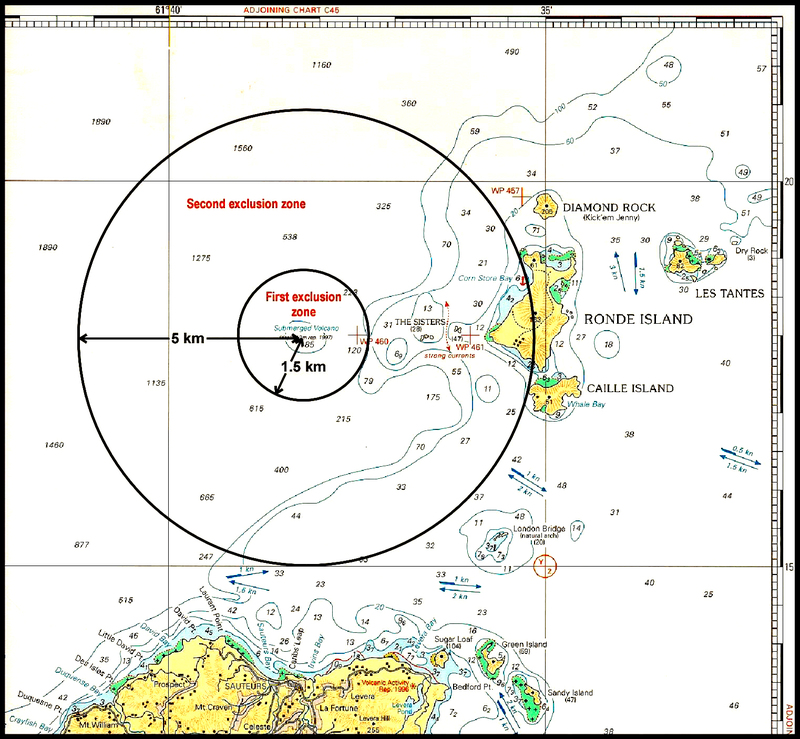 The notice advised marine operators to strictly observe a 5-km maritime exclusion zone (figure 10). Another NaDMA notice on 3 May set the alert level at Yellow, indicating that all vessels should observe the 1.5 km exclusion zone, though as a precaution remaining outside the 5-km zone was recommended. Figure 10. Map showing the two maritime exclusion zones defined at Kick 'em Jenny, north of the island of Grenada. Courtesy of NaDMA. As described by Latchman et al. (2017) in an SRC Open File report on 11 July 2017, subsequent eruptive activity on 29 April 2017 consisted of one event which lasted 14 minutes, followed by about an hour of tremor. The period of unrest began on 8 April with one earthquake. On the days following that first event, and prior to the eruption, there were 0-2 daily volcano-tectonic earthquakes, with 16 in all leading up to the eruption. The eruption was felt in northern Grenada and Martinique as an extended period of shaking, and very high-amplitude T-phases were recorded in Montserrat. There was no surface activity observed. 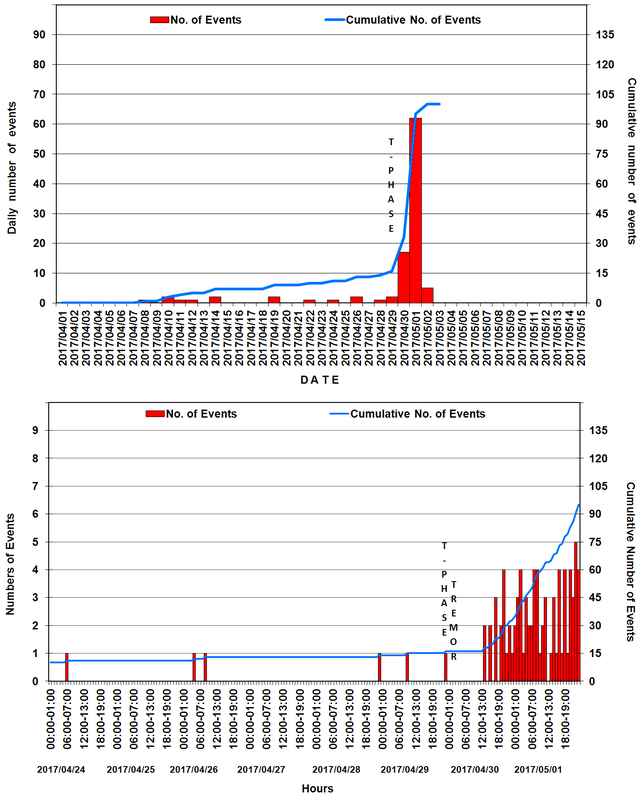 After the eruption there was a sharp increase in the number of hybrid seismic events, with an additional 84 events up to 2 May, after which the activity ceased (figure 11). Figure 11. Seismicity associated with the 2017 period of unrest at Kick 'em Jenny plotted as a daily count during 1 April through 15 May (top) and as an hourly count during 24 April-1 May 2017 (bottom). From Latchman et al. (2017); courtesy of University of the West Indies, Seismic Research Centre. According to UWI-SRC, the 2017 precursory seismicity was low level, the eruption occurred without intensification of the seismicity, and the post-eruption seismicity was relatively abundant, but short-lived. This volcanic episode came just 21 months after an episode consisting of two weeks of precursory seismicity, two hour-long eruptions on 23 and 24 July, and rapid decay of post-eruption seismicity. Reference: Latchman J, Robertson R, Lynch L, Dondin F, Ramsingh C, Stewart R, Smith P, Stinton A, Edwards S, Ash C, Juman A, Joseph E, Nath N, Juman I, Ramsingh H, Madoo F, 2017, 2017/04/29 Eruption of Kick-'em Jenny Submarine Volcano: SRC Open File Report Kick-'em-Jenny, Grenada 201706_VOLC1, Seismic Research Centre, The University of the West Indies, St. Augustine, Trinidad, West Indies. Information Contacts: Seismic Research Centre (SRC), The University of the West Indies (UWI), St. Augustine, Trinidad and Tobago, West Indies (URL: http://www.uwiseismic.com/); National Disaster Management Agency (NaDMA), Fort Frederick, Richmond Hill, St. George's, Grenada, West Indies (URL: http://nadma.gd/). The University of the West Indies (UWI) Seismic Research Centre (SRC) reported that seismic activity at Kick 'em Jenny increased on 29 April. A high-amplitude signal lasting 25 seconds was recorded by stations on Grenada and Montserrat. This signal followed an increase in the number of background events associated with the volcano. The report reminded the public of the 5-km maritime exclusion zone. The Seismic Research Unit of the University of the West Indies reported that a minor eruption began at Kick-'em-Jenny on 4 December and ended by 8 December. The first signs of unrest occurred in October when a slight increase in seismicity was recorded near the volcano. The eruption began on 4 December when a burst of activity started at 0600, peaking at 1100. Following a short lull, activity again increased and culminated in bursts of T-phase signals (acoustic waves generated from an earthquake or underwater explosion that travel through the ocean). The signals were detected between 1918 and 2231 and were interpreted as explosions associated with a submarine eruption. There was no observed activity on the sea surface. The largest earthquakes associated with the eruption were felt in northern Grenada, ~ 8 km to the S. After 7 December, seismicity returned to background levels. During the eruption the Alert Level was raised from Yellow ("volcano is restless") to Orange ("highly elevated level of seismic and/or fumarolic activity") and returned to Yellow on 8 December. According to news reports, small earthquakes and submarine eruptions occurred at Kick-'em-Jenny beginning on about 2 December. The Seismic Research Unit of the University of the West Indies stated in the articles that "The premonitory earthquake swarms were more severe than any previously observed at Kick 'em Jenny but the size of the eruption .... has been very small so far." By 7 December the activity appeared to be calming down. Strong acoustic (T-phase) signals indicated probable submarine eruptions between 0449 and 0530 on 14 January (H. Sigurdsson, 1979, personal communication). "Seismographs throughout the eastern Caribbean recorded strong underwater acoustic signals 29-30 December 1988. The first signals began at approximately 1550 on 29 December. Onset of the signals was extremely emergent, so their point of origin could not be determined precisely, but their pattern of arrivals and amplitudes suggested an origin in the southern Lesser Antilles. The most likely source was thought to be Kick-'em-Jenny . . . . When last surveyed in 1982, the summit of this volcano was 160 m below sea level. The initial signals persisted for approximately 56 minutes. "A shorter but more intense signal was recorded on the 29th between 1722 and 1750. At this time, residents of Sauteurs on the N coast of Grenada felt strong ground vibrations and heard a deep rumbling sound. Although observers in full view of the location of the volcano had been alerted by this time, no disturbance of the sea surface was noted. Vibrations were felt and heard as far away as Martinique, 250 km to the N. Georges Boudon from the Martinique volcano observatory was scuba diving off the N coast of Martinique at the time and distinctly heard the underwater signal. "A third explosion occurred at about 0500 on 30 December. Onsets for this event were much more distinct and it was confirmed that Kick-'em-Jenny was the source. Lt. Col. Glen Mignon of the Grenada Defence Force surveyed the site from a vessel of the Grenada Coast Guard on the morning of 30 December but no disturbance of the sea surface was visible [but see 14:5]. No further explosions have been recorded as of 2 January but as a precautionary measure small vessels have been advised to keep 5 km clear of the volcano until further notice." References. Shepherd, J.B., and Robson, G.R., 1967, The source of the T-phase recorded in the eastern Caribbean on October 24, 1965: Bulletin of the Seismological Society of America, v. 57, p. 227-234. Sigurdsson, H. and Shepherd, J.B., 1974, Amphibole-bearing basalts from the submarine volcano Kick-'em-Jenny in the Lesser Antilles Island Arc: BV, v. 38, p. 891-910. Information Contacts: J. Shepherd, UWI; Lt. Col. G. Mignon, Grenada; C. Antenor-Habezac, Observatoire Volcanologique de la Guadeloupe. Oceanographers in the submersible Johnson Sea-Link observed Kick-'em-Jenny on 15-16 April and 15-16 May, detecting substantial changes in its morphology since surveys in 1978. Most of the large dome-shaped mass that had nearly filled the crater in 1978 was gone in April-May 1989, and the crater had been breached to the E, probably by the December 1988 eruption (13:12). Three lithologies were seen around the crater rim: remnants of the former dome; an apparent explosion breccia composed of blocks from the dome and coarse ballistic material; and a fine-grained pyroclastic deposit, probably a pyroclastic flow, that extended outward from the breach and included some larger matrix-supported blocks. The pyroclastic deposit appeared to be the youngest of the three lithologies, with no ballistic material evident on its surface. The internal structure exposed in the remnants of the basaltic andesite dome consisted of sub-vertical, blade-like dikes radiating from a central lava source, very similar to features observed in the dome that grew in the crater lake at Soufrière of St. Vincent in 1971. No clear examples of pillow lavas were seen at either dome. During the mid-April dives, strong upwelling was occurring from the crater. Bacterial mats several centimeters thick coated the pyroclastic deposit, and numerous dead crabs, shrimp, and fish suggested an anoxic environment at the volcano. By mid-May, the upwelling had stopped, the bacterial mats were breaking up, colonies of polychaete worms were present, and normal fish life was returning. There had been no initial reports of surface disturbance associated with the December 1988 eruption. However, Michael Forshaw, harbormaster at St. George's, Grenada, reported that boats sailing to Carriacou in late December had returned to Grenada after encountering turbulent discolored water near the volcano. No precise dates were available for the observations. Further Reference. Devine, J.D., and Sigurdsson, H., 1995, Petrology and eruption styles of Kick'em-Jenny submarine volcano, Lesser Antilles Arc: J. Volcanol. Geotherm. Res., v. 69, p. 35-58. Information Contacts: H. Sigurdsson, Univ of Rhode Island. Seismic stations along the Lesser Antilles arc began to record very strong acoustic (T-phase) signals, probably associated with an eruption of the . . . Kick-'em-Jenny . . . on 26 March at 1112. Overflights of the area during the period of vigorous seismicity did not reveal any water discoloration or other surface changes above the volcano, which had a summit depth of about 160 m in 1982. Thirteen distinct seismic bursts, lasting up to 19 minutes, were recorded 26-27 March on instruments operated by the Seismic Research Unit, Univ of the West Indies. 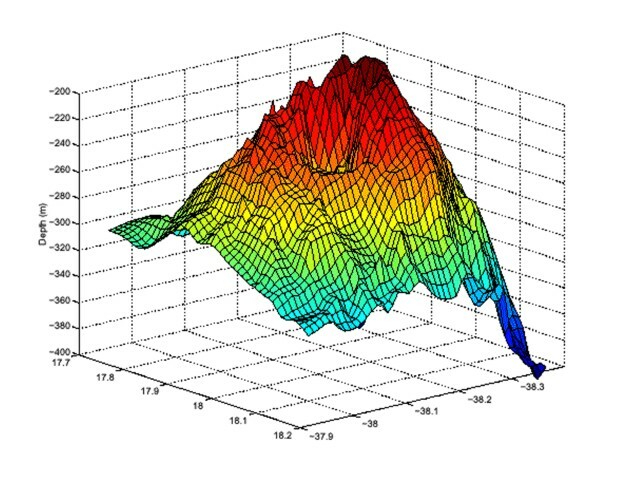 The IPGP's Mt. Pelée seismic network on Martinique, 250 km NNE of Kick-'em-Jenny, recorded strong T-waves on 26 March at 1117:22, 1502:30, 1723, and 2034 (the latter felt by residents of NW Martinique), and on 27 March at 0035:40 and 0424:25. T-waves reached IPGP's Soufrière de Guadeloupe net, 450 km N of Kick-'em-Jenny, on 26 March at 1118. The initial activity saturated the Grenada seismograph and the largest burst of seismicity, at about 1721 on 26 March, was felt on northern Grenada. After a single 14-minute episode that started at 0103 on 28 March, seismicity stopped on all but the Grenada instrument, which continued to record occasional low-frequency (0.5-2 Hz) signals for periods of about 30 seconds to more than 3 hours. The latest reported low-frequency episode occurred on 5 April between about 0500 and 0800. Information Contacts: W. Ambeh, K. Rowley, L. Lynch, and L. Pollard, UWI; A. Redhead, Office of the Prime Minister, Grenada; J.P. Viode and G. Boudon, Observatoire Volcanologique de la Montagne Pelée, Martinique; C. Antenor and M. Feuillard, Observatoire de la Soufrière, Guadeloupe; J.L. Cheminée, N. Girardin, and A. Hirn, IPGP Observatoires Volcanologiques, France. Submarine volcanic eruptions occurred at Kick-'em-Jenny during 4-6 December 2001. The last reported activity at the volcano was in March 1990 when strong acoustic T-phase signals were recorded and interpreted to have been associated with a submarine eruption (BGVN 15:03). The Seismic Research Unit (SRU) of the University of the West Indies reported that the first signs of unrest at Kick-'em-Jenny were observed in October 2001 when a slight increase in seismicity was recorded at stations close to the volcano. Due to the observed increase in seismicity, on 12 September the Alert Level at the volcano was raised from Green ("volcano is quiet") to Yellow ("volcano is restless"). Increased seismicity continued through November, further increasing during 1-2 December when three small earthquakes were recorded. On 4 December a burst of seismicity began at 0600 and lasted until 1100 (figure 1). During 0600 to 1000 the Mount St. Catherine seismograph in Grenada, ~16 km SSW of the volcano (figures 1 and 2), recorded one event every 4 minutes. By about 1000 the earthquake rate had increased to more than one per minute until 1100. Seismographs at the Sisters station, ~2 km E of the volcano, recorded earthquakes in such rapid succession that activity appeared to be continuous. Figure 1. The number of earthquakes from Kick-'em-Jenny recorded per hour and cumulatively at Mount St. Catherine seismograph station during 4 December at 0630 to 6 December at 1830. The station is 16 km SSW of the volcano. "T's" represent the times when T-Phase signals were recorded. In addition to those shown, a short T-phase signal was recorded on 6 December at 1829 that is not on this figure. The number of earthquakes recorded at The Sisters seismograph station, located on a group of rocks less than 2 km E of the volcano, were 10-20 times more numerous than those recorded at the Mount St. Catherine station. Courtesy of SRU. Figure 2. Map of the monitoring system at and in the vicinity of Kick-'em-Jenny. The system was significantly upgraded during 2000-2001 with the addition of seismographs, tide gauges, hydrophones, and tiltmeters in Northern Granada and The Grenadines. Courtesy of SRU. Magnitudes of the larger earthquakes increased throughout 4 December; during 0600-0700 the largest earthquake was M 2, during 0800-0900 it was M 2.4, by 1400-1500 it was M 2.7, and the maximum magnitude earthquake recorded that day, M 3, occurred around 1600. Due to the increase in seismicity, at 1830 on 4 December the Alert Level was raised from Yellow to Orange ("Highly elevated level of seismic and/or fumarolic activity or other unusual activity. Eruption may begin with less than 24 hours notice."). This level of alert meant that ships were not permitted to enter either of two concentric exclusion zones; the first zone was 1.5 km in radius around the volcano and the second was 5 km in radius. The first clear sign of an eruption at Kick-'em-Jenny occurred on 4 December at 1918 when seismometers recorded T-phase signals (acoustic waves generated from an earthquake or underwater explosion that travel through the ocean) (figure 1). The signals lasted about 5 minutes as registered at the Mount St. Catherine station. Another T-phase signal followed at 1926 with a lower amplitude and a shorter duration (3 minutes). Following this eruption the number of discrete earthquakes diminished dramatically; during 1919-2000 there were only eight. Forty five discrete earthquakes preceded the next T-phase signals at 2115. These T-phase signals consisted of a very low-frequency segment followed by a higher-frequency segment that lasted for 6 minutes. A similar event, but with a narrower spectral signature, occurred at 2123. About an hour later, at 2231, the largest T-wave signal during the December episode was recorded at the Mount St. Catherine station, lasting until 2312. T-phase signals were also recorded at the station in Trinidad about 175 km to the S. While this was the largest eruption recorded during the December episode, it was small in comparison to those of March 1990 (BGVN 15:03). Following the 2231 eruption the number of discrete earthquakes was very low, and by 5 December at 0700 only 19 earthquakes occurred. By 6 December seismicity at Kick-'em-Jenny consisted of only occasional small earthquakes. The SRU confirmed that no signs of volcanic activity were visible on the sea surface. By this time, activity seemed to have stopped, but SRU scientists maintained the Orange Alert level for another 24 hours as a precaution. In retrospect, the premonitory earthquake swarms were more severe than any previously recorded at Kick-'em-Jenny, but the size of the eruption as interpreted from the intensity of the T-phase signals was very low. SRU's updates stated that on 6 December as of 1115, many small pleasure craft that were observed traveling directly over Kick-'em-Jenny would be in danger if a larger eruption were to occur. The SRU determined that what was initially thought to be a fairly strong local earthquake (Mt 2.7) on 6 December at 2208 was actually the culmination of a minor swarm of 10-15 microearthquakes directly beneath the volcano. At this point the Alert Level remained at Orange because scientists believed that the eruptions on 4 December probably deposited a layer of hot rock around the summit that would continue to release heat for a long period of time. This hot water would cause the area near the volcano to be turbulent and pose a threat to ships in the vicinity. The Orange Alert Level was further extended after careful scrutiny of seismograph records on 7 December showed that a short T-phase signal was generated from Kick-'em-Jenny on 6 December at 1829. The signal was interpreted to represent a minor eruption, therefore, the Alert Level was extended until 8 December at 1000. Following the 6 December seismicity, there was no further volcanic or seismic activity at Kick-'em-Jenny. After consultation with the government of Grenada, on 8 December at 1000 the SRU reduced the Alert Level at the volcano from Orange to Yellow. The change in Alert Level included a reduction in boating restrictions to only include the first exclusion zone (1.5 km radius from the volcano). Information Contacts: John Shepard, Richie Robertson, Jan Lindsay, and Joan Latchman, Seismic Research Unit of the University of the West Indies, St. Augustine, Trinidad, W.I. (URL: http://www.uwiseismic.com/). Submarine volcanic eruptions occurred at Kick-'em-Jenny during 4-6 December 2001 (BGVN 26:11). Following the 6 December seismicity, no further volcanic or seismic activity were recorded. On 8 December the Alert Level was reduced from Orange to Yellow. On 12 March 2002, the NOAA Research Vessel Ronald H. Brown conducted extensive mapping of Kick-'em Jenny using the SeaBeam® sonar mapping system (SeaBeam® is a registered trademark of L-3 Communications SeaBeam Instruments). The resulting bathymetric map (figure 3) shows several interesting features. Figure 3. Bathymetric sonar map of the Kick-'em-Jenny created on 12 March 2002. Courtesy Seismic Research Unit, University of the West Indies. The volcano's crater is clearly visible (immediately right of center on the image) on top of a symmetrical cone of about 1 km diameter. The crater is nearly perfectly circular with a diameter of ~330 m and a maximum depth of ~80 m. The crater center is located precisely at 12.3004° N, 61.6378° W. The dome, first noticed in 1978 when it almost filled the crater, has now disappeared except for a few remnants on the crater floor. The sonar image shows a breach of the crater to the NE. A prominent escarpment arcs around the E side of the cone and extends at least a few kilometers to the NE and S of the volcano. A series of ridges, principally in the cone's N to W sectors, trend radial or sub-radial to the cone's crater. The topographic image furnished a bases for some new studies. Temperature-depth profiles were obtained within the crater and on the flanks, water samples were collected at a range of depths, and rock samples were collected from the summit region. The Seismic Research Unit of the University of the West Indies reported that complete analysis of the results will take some time but preliminary analysis of the bathymetry confirms that the depth to the summit of the volcano has increased since the last detailed survey in 1989. Depth to the highest point on the crater rim is now ~183 m. The difference between this depth and the depths of ~160 m measured from 1978 to 1989 is probably accounted for by the fact that the dome that filled the crater beginning in 1977 has now completely disappeared. Information Contacts: John Shepard, Richie Robertson, Jan Lindsay, and Joan Latchman, Seismic Research Unit, University of the West Indies, St. Augustine, Trinidad, W.I. (URL: http://www.uwiseismic.com/). The University of West Indies Seismic Research Unit (SRU) has augmented their instrumental monitoring network and warning system at Kick 'em Jenny submarine volcano. In addition to long-period and broadband seismometers to sense earthquakes, they have also employed tide gauges to measure seawater disturbances, hydrophones to discern submarine explosions, and tilt meters and global positioning system (GPS) stations to detect long-term ground deformation. The instruments may disclose anomalies and critical symptoms before an eruption begins. Various combinations of these instruments were installed at Mt. St. Catherine, Sauteurs, The Sisters Rocks, Isle de Ronde, Isle de Caille, and Carriacou (figure 4). Figure 4. A map indicating positions of monitoring instruments for the current network at Kick 'em Jenny. Tilt meters and tide gauges were not functioning at the time of this writing (early 2005). (Inset) Grenada and Carriacou islands lie at the S end of the West Indies. Courtesy of SRU. The NSF Caribbean Tsunami Workshop was held in March 2004 (Mercado-Irizarry and Liu, 2004). The Workshop's program ended its Introduction section with this statement: " . . . Kick 'em Jenny, close to the islands of the southeastern Caribbean (just 10 km N of Grenada), is of much concern to the local governments. Past eruptions during the last century (1939, 1965) resulted in observed deep water tsunamis, with the one in 1939 being measured as 1 m high [Shepherd, 2001]. The concern is such that, for the first time (at least in the region), a banking institution (the Caribbean Development Bank) is funding a monitoring program [at] the volcano." A 29 December 2004 article entitled "Tsunami warning system for the Caribbean," posted on the SRU website, also addressed the issue. It noted that, "The devastation caused by the tsunami which ravaged several Asian countries on 26th December 2004 has sparked discussion on the importance of a tsunami early warning system in the Caribbean. While in theory such a system may seem invaluable in light of the Asian disaster, scientists at the Seismic Research Unit currently believe that several factors should be seriously considered before assuming that a tsunami early warning system would be beneficial to the region. Head of the Seismic Research Unit, Dr. Richard Robertson, says that 'Before the region spends valuable resources on setting up new instruments for a tsunami early warning system, we need to strengthen our existing networks and focus on improving public education and communication activities with regard to geologic hazards in the region.'" Gas release, T-phase seismicity, and minor eruption clouds. The question of whether or not there is strong fumarolic activity in the crater has been a source of speculation for a number of years. It has been suggested that warmed water rising in convection currents contributed to the reputation of the Kick 'em Jenny region for rough water. The emission of large quantities of bubbles was observed in 1989 when the submersible Johnson Sealink entered the crater a few months after the 1988 eruption (SEAN 14:05). A water column containing a significant proportion of rising gas bubbles results in a local lowering of the seawater's density. (The rising bubbles displace some of the sea water, and at or near the sea surface they provide negligible support to the ship, thus resulting in a loss of buoyancy for ships passing over the volcano.) To account for this hazard, and the risk posed by ejecta, an exclusion zone 1.5 km in radius was created over the volcano (Shepherd, 2004). At least 11 historical episodes of hydro-acoustic (T phase) signals have been detected since 1939 when an eruption cloud rose 275 m above the sea surface (Shepherd and Robson, 1967, Smith and Shepherd, 1995, Lindsay et al., 2005). Material was also ejected during the 1974 eruption, and the 1988 eruption was associated with turbulent discolored water (Lindsay and others, 2005). Some of these were described in Smithsonian reports dating back to 1977. Regarding T-Phase waves. A short-period wave group from a seismic source that has propagated in part through the ocean is called T-phase or T(ertiary)-wave (Linehan, 1940; Tolstoy and Ewing, 1950; Walker and Hammond, 1998). The wave group propagates with low attenuation as hydro-acoustic (compressional) waves in the ocean, constrained within a low sound-speed wave guide (the sound fixing and ranging-SOFAR-channel) formed by the sound-speed structure in the ocean. The T-phase signal may be picked up by hydrophones in the ocean or by land seismometers. Upon incidence with the continental shelf/slope, the wave group is transformed into ordinary seismic waves that arrive considerably later than seismic wave groups from the same source that propagated entirely through the solid Earth. 2002 and 2003 Surveys. A 2003 oceanographic survey of Kick 'em Jenny was conducted jointly by the National Oceanic and Atmospheric Agency (NOAA), SRU, and the University of Rhode Island (URI) using the NOAA Research VesselRonald H. Brown. This survey supplemented data obtained previously from a cruise passing the volcano on 12 March 2002 (BGVN 27:06). That effort produced the bathymetric image ... reproduced here as figure 5 (BGVN 27:06). The arcuate scarp on the image suggested that the volcano was once the scene of sector collapse. The inferred submarine debris avalanche has an estimated total volume of ~ 10 km3, and a maximum runout distance of at least 15 km (Sigurdsson and others, 2004; Shepherd 2004). The collapse clearly occurred prior to the growth of the small central edifice at Kick 'em Jenny. The ages of these various features remain unknown. Figure 5. 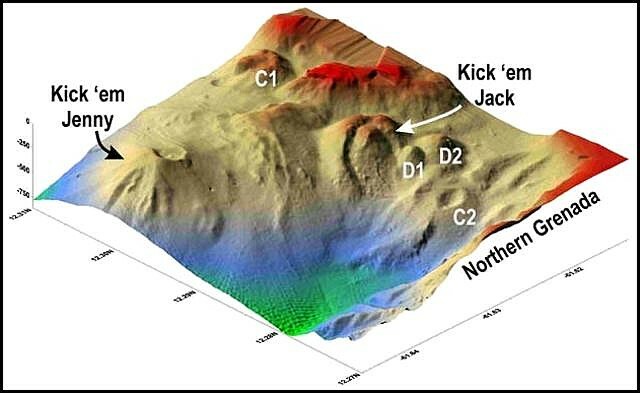 Morphology of Kick 'em Jenny, as revealed by a multi-beam survey by the NOAA Research Vessel Ronald H. Brown in March 2002 (N is toward the top; for approximate scale, the sub-circular summit crater is about ~ 300 m in diameter). The survey showed that the volcano's smaller, modern, active cone sits nested within a larger U-shaped depression that wraps completely around the cone's E side and opens toward the W. This larger depression presumably formed by slope failure and generated a W-directed debris avalanche that appears to lie within a marginal, confining levee. Courtesy of NOAA. Figures 6 and 7 highlight the discovery of other volcanic features on the sea floor just E of Kick 'em Jenny. Little is known about them aside from their basic morphology illuminated by the 2003 survey. Discoveries near Kick 'em Jenny included three craters (C1, C2, and the largest, Kick 'em Jack) and two domes (D1 and D2). The mutual relations and ages of these newly recognized features remain uncertain. Figure 6. Vertically exaggerated SeaBeam image of Kick 'em Jenny and newly identified craters and domes discovered in March 2003. Kick 'em Jenny's summit occurs adjacent to the crater rim at a depth of ~ 185 m. The deepest point on Kick 'em Jenny's crater floor lies at ~264 m depth. The summit sits at 12°18.024'N, 61°38.388'W (12.3004°N, 61.6398°W). The image's left side is drawn N-S (i.e. N towards the upper left). Tick marks along the margins are at 0.01 degree intervals, a spacing equivalent to 1.8-1.9 km. The distance between Kick 'em Jenny and Kick 'em Jack is about 4 km. A vertical scale at the left indicates water depth: 0, -250, -500, and -750 m. Courtesy of NOAA and SRU. Figure 7. Broad-scale SeaBeam image of Kick 'em Jenny and adjacent features compiled from Ronald H. Brown cruise observations, March 2003. North is up. The crater rim of Kick 'em Jenny ("rim"), as well as the rest of the body of that dome, lie within a larger arcuate scarp that wraps around the dome's E side. On the dome's W side the scarp extends outward, crossing a swath of sea floor as two sub-parallel arms (indicated by the arrows). Kick 'em Jack lies well outside this scarp, ~ 4 km SE of Kick 'em Jenny. Courtesy of NOAA and SRU. References. Linehan, D., 1940, Earthquakes in the West Indian region: Transactions, American Geophysical Union, Pt. II, p. 229-232. Mercado-Irizarry, A., and Liu, P. L.-F., 2004, NSF Caribbean Tsunami Workshop, 30-31 March 2004: San Juan Beach Hotel, San Juan, P.R., sponsored by the U. S. National Science Foundation, Puerto Rico State Emergency Management Agency, Department of Marine Sciences at the University of Puerto Rico at Mayagüez, and the Sea Grant Program at the University of Puerto Rico. Lindsay, J. M., Shepherd, J.B., and Wilson D., 2005, Volcanic and scientific activity at Kick 'em Jenny submarine volcano 2001-2002: Implications for volcanic hazard in the Southern Grenadines, Lesser Antilles: Natural Hazards, v. 31, p. 1-24. Shepherd, J.B., and Robson, G.R., 1967, The source of the T-phase recorded in the Eastern Caribbean on October 24, 1965: Bull. Seismol. Soc. Amer., v. 57, p. 227-234. Shepherd, J.B., 2001, Marine and coastal hazards from Kick 'em Jenny submarine volcano, southern Grenadine Islands (copyrighted slide-show presentation): URL: http://www.uwichill.edu.bb/bnccde/grenada/grendoc/KickemJenny/kickemjenny.html. Shepherd, J.B., 2004, Report on studies of Kick 'em Jenny submarine volcano March 2002 and March 2003 with updated estimates of marine and coastal hazards: The University of the West Indies Seismic Research Unit, KEJ Report Feb 2004, St. Augustine, Trinidad and Tobago, West Indies, 44 p.
Sigurdsson, H., Carey, S., and Wilson, D., 2004, Debris avalanche formation at Kick 'em Jenny submarine volcano, in NSF Caribbean Tsunami Workshop, 30-31 March 2004, San Juan Beach Hotel, San Juan, P.R. (URL: http://nsfctw.uprm.edu/agenda.html). Smith, M., and Shepherd, J., 1995, Potential Cauchy-Poisson waves generated by submarine eruptions of Kick 'em Jenny volcano: Natural Hazards, v. 11, p. 75-94. Information Contacts: Seismic Research Unit (SRU), The University of the West Indies, St. Augustine, Trinidad & Tobago, West Indies (URL: http://www.uwiseismic.com); Research Vessel Ronald H. Brown, National Oceanic and Atmospheric Agency (NOAA), Marine Operations Center, Atlantic, 439 West York Street, Norfolk, VA 23510-1145, USA (URL: http://oceanexplorer.noaa.gov/explorations/). The submarine Kick 'em Jenny volcano, 8 km N of Grenada (figure 8), has erupted 12 times since reporting began in 1939. Typical activity consists of explosions over a few days. Explosions on 23-24 July 2015 were the first since early December 2001 (BGVN 26:11). A report published by the Seismic Research Centre of the University of the West Indies (SRC) (Robertson et al., 2015) has described this most recent eruption. Figure 8. 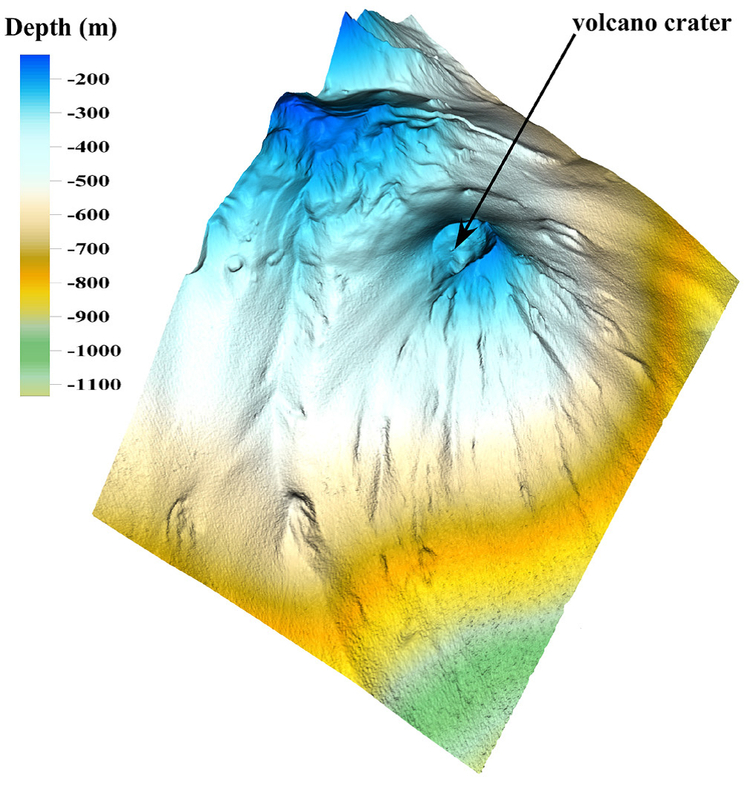 Digital terrain model (DTM) of the Kick 'em Jenny edifice obtained from multibeam data collected during the November 2013 NA039 E/V Nautilus Cruise at KeJ (OET-URI-SRC). Lateral resolution is 5 m. Image from Robertson et al. (2015). Unusual seismicity in the vicinity of the volcano was first observed on 11 July 2015. This consisted of elevated numbers of micro and small events recorded at stations in Carriacou and Granada. The daily counts remained low until 16 July and then increased to 23 events on 20 July. By the evening of 22 July, the cumulative count of events was up to 218 (figure 9); all events were estimated to be less than M 3.0. Figure 9. Daily and cumulative number of earthquakes associated with unrest activity that were recorded on seismic station GCMP located in Carriacou, 10-28 July 2015. Original image from Robertson et al. (2015); corrected image was provided by the Seismic Research Centre, UWI, August 2017 (modified). On 23 July 2015, from about midnight to 1600 local time, the SRC recorded more than 400 events, the largest was M 3.3. Along with the increase in the number and magnitude of seismic events, were 'felt reports' from northern Grenada. At 0142 a strong, continuous signal was recorded on the GCMP and GRGR seismic stations that lasted until about 0258. Strong T-phase signals recorded at seismic stations in Montserrat were interpreted to be an explosion from Kick 'em Jenny. T-phases are acoustic waves generated from an earthquake or underwater explosion that travel through the ocean. The Alert Level was raised to Orange (the second highest level on a 4-color scale) on 23 July, and vessels were instructed to observe an exclusion zone within a 5-km radius of the crater. At about 0002 on 24 July 2015 the seismic network recorded another hour-long explosion signal. A T-phase signal from this event, also recorded in Montserrat, confirmed the nature of the activity. Following the explosion signal there were at least 89 volcanic earthquakes recorded up to 1600 that afternoon. Afterward, and through the next day, seismicity declined (figure 2). During an overflight on 25 July, scientists observed no activity at the ocean surface above the volcano. On 26 July the Alert Level was lowered back to Yellow. Optical and radar satellite images of the area during the eruption period did not show any surface disturbances or evidence of a pumice raft in nearby waters. These observations supported the conclusion that no eruptive material broke the surface of the sea and no eruptive activity continued after the seismic activity ended on 24 July. Information Contacts: Richard Robertson, Seismic Research Centre (SRC), The University of the West Indies, St. Augustine, Trinidad & Tobago, West Indies (URL: http://www.uwiseismic.com). Kick 'em Jenny, a historically active submarine volcano 8 km off the N shore of Grenada, rises 1300 m from the sea floor. Recent bathymetric surveys have shown evidence for a major arcuate collapse structure, which was the source of a submarine debris avalanche that traveled more than 15 km W. Bathymetry also revealed another submarine cone to the SE, Kick 'em Jack, and submarine lava domes to its S. These and subaerial tuff rings and lava flows at Ile de Caille and other nearby islands may represent a single large volcanic complex. Numerous historical eruptions, mostly documented by acoustic signals, have occurred since 1939, when an eruption cloud rose 275 m above the sea. Prior to the 1939 eruption, which was witnessed by a large number of people in northern Grenada, there had been no written mention of the volcano. Eruptions have involved both explosive activity and the quiet extrusion of lava flows and lava domes in the summit crater; deep rumbling noises have sometimes been heard onshore. Historical eruptions have modified the morphology of the summit crater. Devine J D, Sigurdsson H, 1995. Petrology and eruption styles of Kick-'em-Jenny submarine volcano, Lesser Antilles island arc. J. Volcanol. Geotherm. Res., 69: 35-58. Latchman J, Robertson R, Lynch L, Dondin F, Ramsingh C, Stewart R, Smith P, Stinton A, Edwards S, Ash C, Juman A, Joseph E, Nath N, Juman I, Ramsingh H, Madoo F, 2017. 2017/04/29 Eruption of Kick-‘em Jenny Submarine Volcano. SRC Open File Report Kick-‘em-Jenny, Grenada 201706_VOLC1, Seismic Research Centre, The University of the West Indies, St. Augustine, Trinidad, West Indies. Lindsay J M, Shepherd J B, 2005. Kick 'em Jenny & Ile de Caille. In: Lindsay J M, Robertson R E A, Shepherd J B, Ali S (eds). Volcanic Hazard Atlas of the Lesser Antilles, Trinidad and Tobago, Seismic Res Unit, Univ West Indies, p 107-126. Lindsay J M, Shepherd J B, Wilson D, 2005. Volcanic and scientific activity at Kick 'em Jenny submarine volcano 2001-2002: implications for volcanic hazard in the southern Grenadines, Lesser Antilles. Nat Hazards, 34: 1-24. Sigurdsson H, Sparks R S J, 1979. An active submarine volcano. Nat Hist, 88: 38-43. University of the West Indies, Seismic Research Unit, 1999-. Kick 'em Jenny submarine volcano. http://www.uwiseismic.com/kejtitle.html (20 April 2001, 25 Mar 2003). There is no Deformation History data available for Kick 'em Jenny. There is no Emissions History data available for Kick 'em Jenny. A Sonar image shows the submarine Kick-'em-Jenny cone from the NE in 1996. Depths are nominally meters but have an uncertainty of about 10%. This image shows the upper several hundred meters of the submarine volcano that lies 8 km off the north shore of Grenada and rises 1300 m from the sea floor. Numerous historical eruptions, mostly documented by acoustic signals, have occurred since 1939 and involve both explosive activity and the quiet extrusion of lava flows and lava domes. Image by Doug Martin, 1996 (NOAA, courtesy of Seismic Research Unit, University of West Indies). Vertically exaggerated SeaBeam image shows Kick 'em Jenny and newly identified craters and domes discovered in March 2003. Kick 'em Jenny's summit occurs adjacent to the crater rim at a depth of ~ 185 m. The deepest point on Kick 'em Jenny's crater floor lies at ~264 m depth. The image's left side is drawn N-S (i.e. N towards the upper left). Tick marks along the margins are at 0.01 degree intervals, a spacing equivalent to 1.8-1.9 km. The distance between Kick 'em Jenny and Kick 'em Jack is about 4 km. Image courtesy of NOAA and Seismic Research Institute, 2003 (published in GVN Bulletin). The Global Volcanism Program has no maps available for Kick 'em Jenny. There are no samples for Kick 'em Jenny in the Smithsonian's NMNH Department of Mineral Sciences Rock and Ore collection. IRIS seismic stations/networks Incorporated Research Institutions for Seismology (IRIS) Data Services map showing the location of seismic stations from all available networks (permanent or temporary) within a radius of 0.18° (about 20 km at mid-latitudes) from the given location of Kick 'em Jenny. Users can customize a variety of filters and options in the left panel. Note that if there are no stations are known the map will default to show the entire world with a "No data matched request" error notice. Large Eruptions of Kick 'em Jenny Information about large Quaternary eruptions (VEI >= 4) is cataloged in the Large Magnitude Explosive Volcanic Eruptions (LaMEVE) database of the Volcano Global Risk Identification and Analysis Project (VOGRIPA).